Another succesful project is NutriMed Dietary Supplement Producing Ltd. Beta Research Institute Nonprofit Ltd.
Mortoff IT Consultation Service Ltd.
Last week INCluSilver held its very first workshop in innovation in personalised nutrition through cluster cooperation for the Silver Economy. Interested SMEs and experts met up with INCluSilver’s partners in Santiago de Compostela, Galicia, Spain for the day-long innovation boot camp, and among the exciting many projects that were presented was Food4Me. Like INCluSilver, Food4Me is also an EU-funded project that works with personalised nutrition, but the similarities end there. While INCluSilver deals with funding innovative SMEs with solutions for the elderly within personalised nutrition, Food4Me emerged out of the need for more research into the current knowledge of personalised nutrition. In 2000, the complete mapping of the human genome sequence brought about the possibility of individualised medicine and the birth of the field of “nutrigenomics”, which examines the relationship between food and gene expression. However, the promise of personalised nutrition has failed to develop as a commercial service. In order to do this, Food4Me has gathered an international group of experts to survey the current knowledge of personalised nutrition and to explore the application of individualised nutrition advice. The Food4Me project will also investigate consumer attitudes and produce new scientific tools for implementation. Research carried out by Food4Me has resulted in much-needed knowledge into the field of personalised nutrition. One of the key points is that people are very interested in getting information about the benefits of adopting personal nutrition. This, however, can be challenging as the perceived benefits may vary between consumers. Another important factor to getting consumers interested is to make information available about the ease of adopting personalised nutrition since this could convince potential users of the benefits. Protection of privacy is another issue of concern among consumers, which is unsurprising in this day and age. As a result, they require transparent regulations regarding the protection of data and proper enforcement of these regulations across both the private and public sectors, as well as open communication with the public about data protection to inspire trust. Finally, consumers expect a certain level of expertise and credibility in personalised nutrition providers, and they want a health professional to be involved in the provision of personalised nutrition information. Food4Me’s research suggests that increasing the intensity of feedback to consumers may be counterproductive. Furthermore, only wealthy participants are willing to pay for personalised nutrition services. Thus, careful analysis of the costs required to provide such services is still needed. Funding continues in 2nd round of vouchers for new solutions within nutritional innovation for the growing number of elderly citizens in Europe. The 2nd round of application by the EU-backed INCluSilver project has resulted in €425,000 in funding for 11 small and medium enterprises (SMEs). The companies will receive 75 % of their grants upfront within the next month to develop solutions within the field of personalised nutrition for the elderly. Chosen from among 37 applicants from all over Europe, the final 11 SMEs will get up to €60,000 each with plenty of money left for the next round’s applicants. “With the number of elderly citizens in Europe on the rise, it is important to create new nutritional solutions to ensure healthy ageing. That’s why we want to fund as many innovations as possible that improve quality of life for the elderly,” says Per Simonsson, Project Coordinator on the INCluSilver project. The projects represent INCluSilver’s five collaborative sectors: agro-food, health, packaging, ICT, and creative industries. All of the selected companies and their respective projects will be featured on the INCluSilver website. “The INCluSilver project consists of two aspects: improving the lives of the elderly and providing support to small companies that develop innovations that contribute to this. Both of these things help the economy in Europe flourish as a whole,” says Per Simonsson. Other than offering funding, the INCluSilver project also hosts entrepreneurial events and workshops where SMEs from all over Europe can meet, providing the perfect network to gain access to both European and international markets. 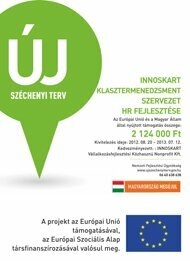 The Innoskart ICT Cluster, headquartered in Székesfehérvár, has 80+ SME and higher education institutions as cluster members. During its 12 years of work, it performs activities that contribute to create, maintain and strengthen innovative co-operation between members. Our main strategic goal is to reach digital solutions by finding industrial needs, creating a solution and launching the market - all of these are to build co-operation within the cluster. A series of training sessions (webinars) that target the amelioration of entrepreneurial and innovation skills of SMEs will take place over the coming months. INCluSilver Innovation Support Services consist of a first step for assessing and redirecting new cross sectorial and cross borders innovative projects in order to boost their potential. SMEs and new enterpreneurs are given the opportunity to highly benefit from the provision of professional training and expert services primarily addressing the basic concepts of business plan creation, commercialisation, marketing and branding strategy etc. and pave the way for further development of their innovative ideas or business projects in the main INCluSilver areas of intervention. The first series of five consecutive webinars will begin soon. The dates are indicated in the table below. Participation to the webinars is free of charge but registration is mandatory as places are limited. After the registration, you will receive more details about the webinar. One of hungarian project is Alba Kenyér "SilverBread"
“An apple a day keeps the doctor away” – that saying might be truer now than ever before since a recent study conducted by a team from University College London has uncovered a connection between following a Mediterranean-style diet with lower risk of frailty in older adults. While loading up on fruits and vegetables has always been considered healthy, the new study shows that there is a significant association with those who eat primarily plant-based diets rich in fruits, vegetables, nuts, legumes, and whole grains and reduced risk of frailty. The term “frail” has recently emerged as a concept to assess the overall health status of older people, with frailty involving deficit accumulation and depleted physiological reserve across multiple body systems. As a result, frail people are more likely to suffer from fractures, hospitalisation, disability, and dementia. Moreoever, frailty increases with age, plaguing those who often already have multiple medical problems and disabilites, and lowers quality of life. As Europe’s older population grows, the problems stemming from frailty have become a pressing issue among healthcare providers and those it afflicts. Nutrition plays a vital role in the development of frailty, and new research indicates that a healthy diet is associated with lower risk of becoming frail. A recent analysis of almost 6000 older individuals from France, Spain, Italy, and China has resulted in consistent evidence that those who follow a Mediterranean diet are 50 percent less likely to become frail compared to those who do not. Research also shows that the benefits of adhering to a Mediterranean diet extends beyond preventing frailty. A healthy diet emphasising plant-based foods may help older people maintain muscle strength, weight, activity and energy levels, and thus, improve quality of life in multiple ways. While research shows that adhering to a Mediterranean diet is associated with significantly lower risk of frailty in older people, future studies are needed to confirm just how stictly a Mediterranean diet must be followed to effectively reduce the risk of frailty. The INCluSilver panel of experts met for a collective session a few months ago with the purpose of developing a set of competencies key for SMEs’ innovation efforts in the context of personalised nutrition. The 19 experts agreed on seven competencies vital for small and medium sized companies to either possess or be aware of if these companies are to be successful and innovative in the context of developing personalised nutrition products or services for older adults. The panel debated the competencies in groups of four and each group selected five competencies. Collaboration competency, business competency, and consumer understanding were highlighted by all four groups. The experts noted that it would be crucial for the success of the projects that the partners identify, reach out to, and collaborate with experts who possess competencies that they don’t possess themselves. Especially if they are missing a number of the seven highlighted competencies. The need for a technological competency and understanding was also discussed by the experts. However, the experts linked this competency to two of the other seven competencies: consumer understanding and market analysis. In order to develop a successful piece of technology, it is crucial to identify whether it covers a gap in the market and whether it addresses an actual consumer need. The last two of the seven competencies are the fundraising competency and the nutritional competency. The expert panel felt that in most cases SMEs need to have a certain level of understanding of the nutritional sciences themselves in order to develop personalised nutrition products. Read more about the members of the panel of experts here. How the IoT is creating "precision farming"